Saint Romanus, who was from Antioch, lived during the reign of Maximian. He presented himself before Asclepiades the Eparch, and rebuked him, saying, "The idols are not gods; even a little child could tell you that." Then the Saint asked that a child be brought in from the market, that he might be the judge of the matter at hand. Therefore, when the child was asked, "Which God must we worship?" he replied, "Christ." The child was beaten mercilessly and beheaded at the command of the tyrant. As for Saint Romanus, his tongue was cut out, and then he was cast into prison, where he was strangled in the year 305. O all-lauded Romanus, since the Church hath thee as a bright, majestic star, she is now guided by the light of thy great contests, and she doth praise and glorify thine all-luminous memory. 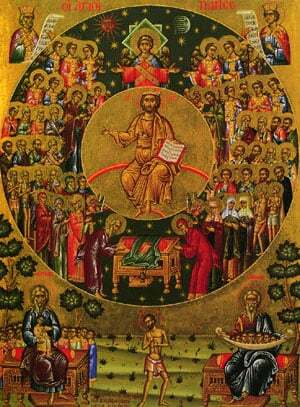 Share the feast of Holy Martyr Romanus with an icon greeting ecard.